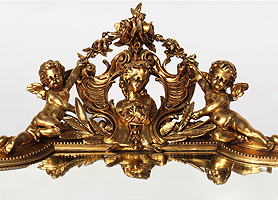 A Tall and Impressive French 19th-20th Century Belle Époque Gilt Wood and Gesso Carved Grand Hall Figural Mirror. 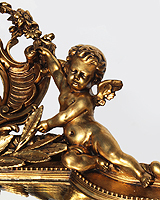 The imposing slender frame crowned with an allegorical group centered with a maiden bust within an acanthus design flanked by a pair of cherubs holding a floral wreath, with a beveled glass mirror plate. Circa: Paris, 1900.